황남대총 남분 은관(皇南大塚南墳 銀冠)은 경주시 황남동 미추왕릉 지구에 있는 삼국시대 신라 무덤인 황남대총에서 발견된 은관이다. 황남대총은 2개의 봉분이 남·북으로 표주박 모양으로 붙어 있다. 이 은관은 남쪽 무덤 널(관) 밖 머리쪽 껴묻거리 구덩이(부장갱) 안에서 발견된 것으로 높이 17.2㎝, 머리띠(대륜) 너비 3.2㎝, 지름 16.6㎝이다. 머리띠 위의 장식은 3개의 가지가 있는 모습으로 신라시대 관모(冠帽)에서는 보기힘든 독특한 양식이다. 중앙가지는 위에 돌기가 있고, 활 모양으로 휘어지며 위가 넓고 아래가 좁은 마름모 형태의 은판을 붙였다. 좌우에는 반달형 은판을 붙이고, 바깥쪽을 일정한 폭으로 오려낸 다음 하나하나 꼬아서 새털 모양을 만들었다. 새털 모양의 가지는 신라 금관 형식에는 없었던 것으로서, 의성 탑리 무덤에서 이와 유사한 관모가 발견된 적이 있지만 경주지역에서는 처음 발견된 예로서 주목된다. 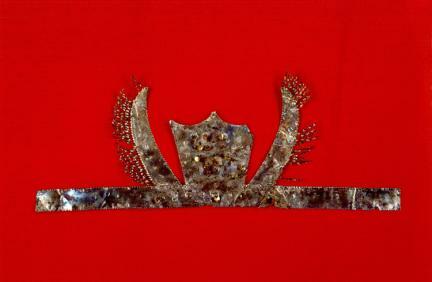 This silver crown from Silla was found among articles buried with the body in the south mound of mound No. 98, Hwangnam-dong, Gyeongju. The articles were placed outside the wood coffin towards the head. The crown is 17.2 cm high, 16.6 cm in diameter, and the width of the headband is 3.2cm. The decoration over the headband consists of three branches. This is quite a unique mode unlikely to be seen in other official headdresses of the Silla era. The branch in the center is bent like a bow and has a projection at the top. There is a diamond-shaped silver plate with a wide top and a narrow bottom attached to this branch. On both sides there are crescent-shaped silver plates. The outside parts of these plates are clipped and then twisted to make a sort of feather-like shape. Such feather shape branches are a unique feature, not seen in other gold diadems of Silla. 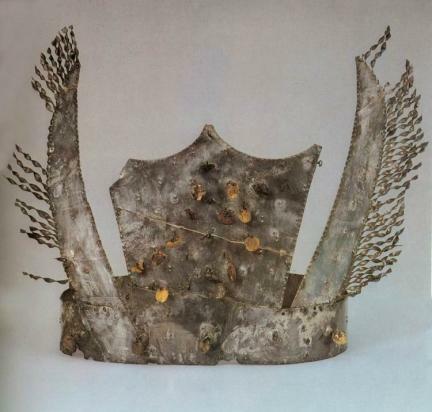 A similar official headdress was found in Uiseongtamni Ancient Tombs, but this is the first discovery in Gyeongju. Tumulus No. 98 in Hwangnam-dong is a Silla tumulus that has come down from the Three Kingdoms period. Its serial number is 98 and it is located in the Tumuli Park of tomb of King Michu. It was named Hwangnamdaechong Tomb after investigations in 1973 and 1975. It has the shape of a small gourd, the two mounds being connected north and south. It is the largest of the Silla dynasty mounds. Its diameter is 80m east-west and 120m north-south. The south mound is 23 m high, and the north mound is 22 m high. The inside of the tumulus is made by piling up stones over the coffin, which is characteristic of tombs made in the Silla era.